We write to you at the end of a productive year for the Consortium. We believe it’s important to look back and celebrate all that we have accomplished as an organization. 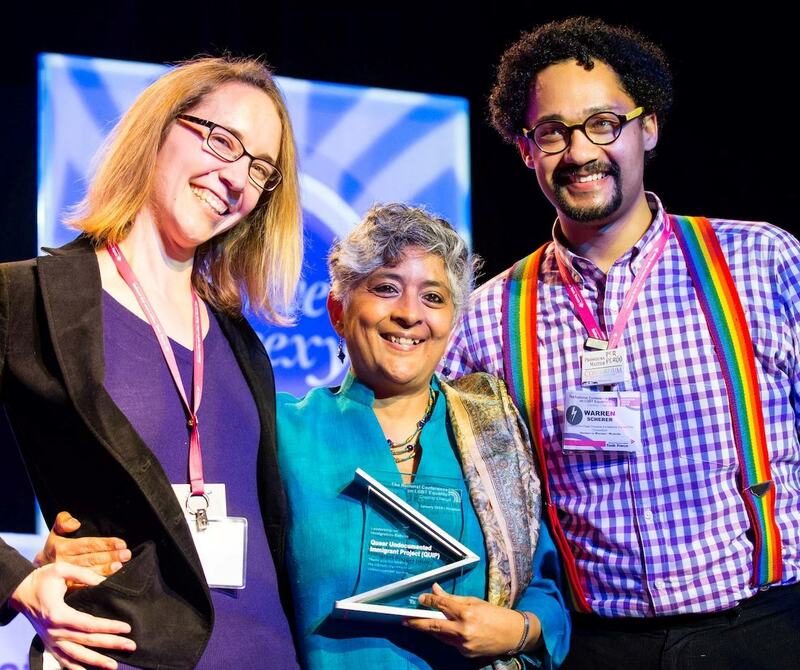 At Creating Change 2014, in Houston, through the Consortium Awards, we celebrated the professional contributions of Shiva Subbaraman, Chicora Martin, and Zaneta Rago. Our suite was well-used, for constituency group meetings and socials. And as always, our LGBT Campus Resource Professionals institute was filled to bursting. We hope to see you in Denver! A talented committee chaired by Dr. Genny Beemyn created a resource guide for higher education professionals to provide better support to trans* students. This guide is available for free from the Consortium website. In July, we hosted our summer institute, titled “Points of Influence: LGBTQ Students, Social Change, and You.” Thanks to our Education Chair, Shaun Travers, and the team at University of Vermont (UVM) who made the institute possible. After the institute, we conducted our retreat, also at UVM. This time together allowed us to connect as a group and to make plans for the year to come. We grounded our work in our values of anti-racism and inclusion. Much of our work this year was set into motion at the retreat. As of October, the Consortium is officially recognized as a 501(c)3 non-profit! Confusing paperwork aside, we are so thrilled it is complete. Donations to the Consortium are now tax-deductible. (And in fact, you can donate easily right here, through our website.) Non-profit status also allows us to apply for grants, which we will continue to do over the next year. Thank you to the 170 members who completed our 2014 Self-Study. The results will be available in February 2015. The results will allow members to compare themselves to other campuses, lobby for increased resources, and follow trends in LGBT higher education. From February 4 - 8, we will gather for Creating Change in Denver, CO. The Education Committee will ensure that this year’s events will be stellar. Nominations for board positions will be open at that time; if you are interested in being involved, get in touch with a board member. In the summer, we will once again host our Institute and Retreat; watch your email for more information soon. Finally, we would like to thank the amazing board members with whom we have the privilege to work: Celiany Rivera–Velázquez, Chris Woods, Craig Leets, Danielle Steele, Jennifer Miracle-Best, Jen Self, LB Hannahs, Lea Robinson, Leisan Smith, Matt Bruno, Meg Evans, Shaun Travers, and Zaneta Rago. We appreciate your commitment to this organization and to the field. We are so glad to work with the regional representatives: Maure Smith-Benanti, Julia Keleher, Brad Freihoefer, Molly Holmes, Jesse Beal, Courtney Dallaird, Steven Willich, Adriana di Bartolo, Sidney R. Gardner, Petey Peterson, Joel Bolling, and Brian Edwards. And finally, thank you to Cornell Woodson and Judy Jarvis for your work coordinating our educational calls. We also are grateful for the support of you, our members. Your active engagement with the e-lists, forums, regional events, and annual meetings make the Consortium what it is. Thank you, and may you have a wonderful new year. Queer & Trans* Liberation Includes the Eradication of Anti-Black Racism & Police Violence ~ This Struggle is Our Struggle! The Consortium of Higher Education LGBT Resource Professionals stands in solidarity with our members, communities, and all communities who are deeply saddened and disappointed by the decision not to indict Officer Darren Wilson for the shooting death of Michael Brown, Jr. This decision to not indict Officer Darren Wilson, as well as the actions and opinions that led up to this decision, speaks to the structural racism that is embedded in our judicial system. The Consortium remains steadfast in our stance against police brutality, the excessive use of force, and the militarization of police forces, specifically as it affects Black communities and other communities of color. Mills College & Mount Holyoke College Break the Glass Gender Binary by Admitting Trans Women!